What factors encourage high levels of student participation in a self-access centre? English Language Writing Centres in Japanese Universities: What do Students Really Need? Report on the Japan Association of Self-Access Learning (JASAL) Forum, at the Japan Association for Language Teaching (JALT) 2009 Conference in Shizuoka. Self-Access Language Learning in Museums: A Materials Development Project. The L2 Passionate Interactional Imperative (for short “The L2 Pie”): It’s Hot or It’s Not! Language learning strategy research: Where do we go from here? Writing Centers: Who are they for? What are they for? So You Want to Start a Peer Online Writing Center? Self-Regulation: Why is it Important for Promoting Learner Autonomy in the School Context? Analysing Advising Dialogue from a Feminist Perspective: Gendered Talk, Powerless Speech or Emotional Labour? Autonomous Language Learning in Self-Access Spaces: Moodle in Action. Discovering Methods of Bettering our Writing Desk: A Report on Visits to US University Writing Centers. Self-Access Centre and Autonomous Learning Management: Where Are We Now and Where Are We Going? Doyle, H., & Parrish, M. (2012). Investigating students’ ways to learn English outside of class: A researchers’ narrative. Studies in Self-Access Learning Journal, 3(2), 196-203. This paper provides a summary of a multi-stage research project described through the narratives of the two authors. The research project investigated what students thought were effective (i.e., Good) and less effective (i.e., Bad) ways to learn English. The paper presents some of the main findings of the various components of the studies. One important finding relevant to educators working in self-access centres is that students responding to the open-ended portions of the study did not mention electronic, online or multimedia resources, or self-access learning centres (SALCs). Follow-up closed-response questionnaire findings indicated that students evaluated electronic resources and SALCs positively as good ways to learn outside of class. The authors suggest that a questionnaire-based list of ways to learn English out of class is an effective way to raise students’ awareness of alternatives for learners. Subsequent diary studies showed how participants used ideas that were introduced mainly via the questionnaire for their outside class study. Language advising practice aims to assist language students to become effective autonomous learners. In order to do this, ideally advisers should be conscious of their students’ preferences for, if not experiences with, different ways to learn. Some ways may be considered by learners “Good” – they work or are seen as effective – and some ways may be considered “Bad”. There is another set of ways to learn which are characterized as not being in a student’s repertoire or even in his or her consciousness. This is a summary of a multi-phase research project which investigated learners’ preferences for learning outside of class, and discovered one approach to raising students’ awareness of alternative ways of learning. The shorter-term project started in 2008 as an ad hoc study of the ways students choose to learn English outside of class. It subsequently expanded to include an investigation of students’ attitudes and consciousness levels regarding traditional ways to learn English outside classrooms, and non-traditional means including electronic media, online resources, and self-access centers. “Ways to learn” is an expression used throughout this paper, with the terms good and bad indicating what learners believe to be effective and ineffective ways respectively. The expression was initially drawn from the wording of a diagnostic writing task for students which was the basis for data collection early in the project (see Doyle, 2009a). In similar studies, Malcolm (2004) referred to “ways to improve English” (p. 1), and Pearson (2004), drawing on Bialystok (1981), mentioned “functional practices” (p. 1) and referred to “out-of-class language learning behaviour” (p. 2) and “activities” (p. 4). The term ways has been maintained by the authors to maintain the integrity of our project and distinguish between learning strategies which may entail conscious planning, cognition and even a rationale. The paper begins with the narratives and retrospective views of each author in turn. It concludes by discussing how research outcomes may assist the work of language advisers, and finally indicates further directions for research. What are some Good and Bad ways to learn English out of class? Suddenly I found myself with 20 pieces of writing which also looked like a convenient set of data to analyze in my role as researcher at the university. This I did, producing a study which was presented in 2008 (see Doyle, 2009a). What I found was that students preferred and rejected traditional learning approaches in equal measure. Strongest preferences were for easier, leisure-type approaches – listening to music or songs, watching movies with and without subtitles. (These were later categorized “Good Ways: individual”). Further, another set (categorized “Good Ways: social”), was slightly less popular and included talking to foreigners or people who were good at English. It was clear that these ways to learn were preferred partly because they are less taxing, though less effective unless a language learning plan or regimen is in place. A second finding was discovered because of an absence in data. There were no mentions of any electronic media, online resources, or SALCs. This was in strong contrast to findings in similar studies, for example, of Chinese learners of English in New Zealand by Pearson (2004) and Arab learners in the Middle East (Malcolm, 2004). 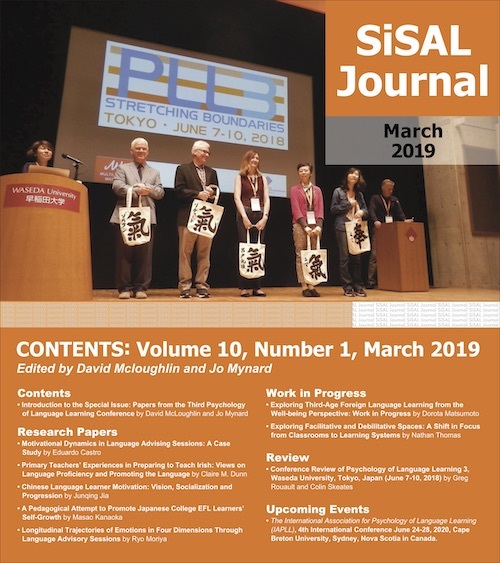 The absence of the mention of SALCs was potentially explainable as they are not generally present in Japanese high schools. However, I was surprised to find no mention of technological learning resources in high-tech Japan where I assumed young people were familiar with electronic media applications. A similar trend was observed by Lockley (2011), who noted that Japanese students had access to many types of technology but limited familiarity with their use in an academic context. A chance to replicate and compare the unexpected findings of the original study with a larger sample occurred the following year. This time I had two classes from whom data was similarly collected in the first half hour of the first lesson. One difference was that this time a Likert-scale questionnaire was constructed and administered as well. The questionnaire drew on open-ended student responses from the initial study among other items. This extra closed-question approach was used in order to triangulate the open-ended data collected in the first instance. The findings have been described more fully elsewhere (see Doyle, 2009b), but in summary, I found that similar response patterns emerged from the initial open-ended data. More traditional and orthodox ways to learn (or practice) English were mentioned, and, once again, electronic and online media and SALCs did not feature at all. More intriguing were the results of the closed-response questionnaire. Although the opinions about Good Ways and Bad Ways in the open-ended data correlated with the questionnaire data, electronic media, online resources, and SALCs received significant mention and rated generally better than average this time despite not being mentioned at all in the first open-ended instrument. In all, the Likert-item data showed that the students considered using electronic resources to be Good Ways to learn outside class. A speculative explanation was that the Likert-item instrument worked schematically for respondents. They did not need to access their own memories and consciousness to formulate answers. Rather they just recalled experiences or applied their common sense to make evaluations. A data collection instrument used in a study by Lockley (2011) appears to have worked similarly as a set of extrinsic schematic prompts. Lockley found that students in Information Studies classes in Japan reported varying and extensive use of electronic and information technologies for leisure and study. However, the respondents had been presented with a set of options by the collection instrument itself. From a language advising perspective, a questionnaire could act as an awareness-raising instrument for informing learners of a broader range of ways to learn outside class which could include electronic media, online resources, and SALCs. However, this did not explain electronic media, online resources, and SALCs being absent from the open-ended response data two years running. I began to speculate about how my students’ open-ended preferences reflected their prior learning experiences, from which arguably they drew their notions of “good” and “bad” ways to learn English. The data from the Likert-item instrument appeared to contradict the open-ended data findings with regards to electronic resources and SALCs. A more substantially grounded explanation was needed. In this sense I was not fully convinced of the validity of my own studies. I wished to investigate different kinds of learners in other locations, in other learning institutions. At that time I had no direct access to nor contact with such institutions. I needed help, so I contacted my erstwhile colleague in a larger university in Kyoto. When my co-author showed me his two studies (Doyle 2009a, 2009b) and asked for my help, I was curious initially to find how my students preferred to learn and what differences there might be in the students’ consciousness of and preferences for various ways of learning between the two universities. I was also conscious of how I might use this information to help me to advise them, in particular regarding learning while studying abroad. Also, like my colleague, I found it odd that his findings showed that none of the students had mentioned online resources, computer-assisted language learning (CALL), or even libraries, language laboratories, or learning centers. In April and May of 2010, I administered the same data-collection instruments my co-author had used in 2009 to approximately 200 students at two major private universities in Kyoto (see Parrish, 2010 for more details). These learners, too, made no mention of electronic media, online resources, or language resource centres until later prompted by the Likert-item instrument. This discovery was even more baffling in light of the fact that one group had received the questionnaires within one hour of an orientation of their library online resources centre. I conducted the same data collection process again one semester later with higher-level students, and the findings were similar (Parrish, 2010; 2011). My findings strongly resembled those of my co-author’s studies. There was, however, one extra finding that resulted from the second data collection: the higher the level of the student, the greater the repertoire of ways to learn English. Whether it was from experience, motivation, maturity, or aptitude, the positive correlation between language level and repertoire of favoured ways to learn English interested me as a topic of further research. Griffiths (2008) indicated that personal characteristics can lead learners to pursue certain kinds of learning activities. Pearson (2004) also illustrated the variety of ways and the variation between students in terms of learning English outside of class. To explore the question of which ways of learning my students preferred and why, I drew on the experiences of Mahadzir, Ismail and Ramakrishnan (2009). I designed a diary-study project to be conducted as a reflective learning exercise with a group of motivated, upper-intermediate students in a year-long intensive English program at a large, private university in Kansai, Japan. The diary study found that once students had been introduced to the idea of using electronic or online resources through the Likert-scale survey from the initial studies (among other activities), more students reported using them as part of their English language learning repertoire. The diaries indicated that students watched NHK news online, talked with siblings via Skype, and wrote emails in English. Nevertheless, a majority of students preferred more traditional ways of using English outside of class including studying for norm-referenced, standardized tests of English proficiency such as the TOEIC and TOEFL. A few students showed creativity and resourcefulness in their ways of studying, for example, by talking to themselves in English, thinking about how they might handle a task in their daily lives in English, or singing karaoke in English. In their diaries, students described how they actually used English rather than listing ways they should use English. Students expressed their satisfaction with how they were learning and practicing, but also their frustration. Some of the popular “Good Ways” to learn such as watching DVDs, when they were actually tried, turned out to be more challenging and frustrating than helpful. Though the most recent evolution of the project, diary studies, moves beyond my co-author’s original points of interest, reading (in the diaries) what students do to learn English and how they regard these approaches provides valuable insights for me as a language teacher and occasional language advisor. This research began as an ad hoc diagnostic tool for students and evolved into a tool to examine how Japanese EFL students prefer to practice (and hopefully improve) English outside of class. After repeated administration of this survey instrument in different contexts, the results show that students have preferences for certain ways of learning; they develop a repertoire of strategies and activities that work for them, but that does not mean they do not need some guidance. New resources or ways (such as using SALCs or online resources) when brought to students’ attention are also seen as viable. Personal choice and enjoyment are important factors, too. The studies indicated that if something is not enjoyable, students are less likely to choose to do it. The diary studies revealed that students had misconceptions about “Good Ways” (such as watching a DVD in English), eventually finding them too difficult. The findings reinforce the need for advising for language learning and the importance of investigating students’ needs, interests, and abilities before mediating and negotiating appropriate tasks that they enjoy, and from which they benefit. Further research should look beyond quantitative identification of students’ preferred ways to learn. This may include exploring rationales and other aspects of learners’ cognitive behaviour, such as strategising and personalised criteria for successful and unsuccessful language learning. This has already been partially attempted with the diary studies. Further, data collection can expand to focus groups and in-depth individual profiling of learners to view more intrinsic aspects of their learning behaviour as well as including learner populations outside of universities. For educators and students alike, it is helpful to know which ways to learn outside of the class are available and which ones learners actually use. Howard Doyle is an Associate Professor at Kochi University Department of International Studies in Japan. His current research interests include Ecology of English in the world, Academic Literacies and Discourse Analysis. Michael Parrish is an Instructor of English as a Foreign Language in the Language Center at Kwansei Gakuin University, Nishinomiya, Japan. He has been teaching foreign languages for 20 years. His current research interests include Early-Childhood Language Development, Literacy Skills Development and Independent Learning. Bialystok, E. (1981). Teaching and researching autonomy in language learning. Harlow: Pearson Education. Breen, M. (1985). The social context for language learning – a neglected situation. Studies in Second Language Acquisition, 7, (pp. 135–158). Doyle, H. (2009a). Japanese university students’ awareness of learning English outside of class. In A. Stoke (Ed. ), JALT2008 Conference Proceedings (pp. 275-282). Tokyo: JALT. Doyle, H. (2009b). Students’ ways to learn English out of class: a re-check. Research Reports of the Department of International Studies, Faculty of Humanities and Economics, Kochi University, 10, 17-30. Griffiths, C. (2008). Strategy and good language learning. In C. Griffiths (Ed. ), Lessons from good language learners (pp. 88-93). Cambridge, UK: Cambridge University Press. Lockley,T. (2011). Pre-university experience of ICT and self-access learning in Japan. Studies in Self-Access Learning Journal, 2(3), 182-194. Mahadzir, M.I., Ismail, N., & Ramakrishnan, K. (2009) The diaries of ESL Learners: A fresh look at language learning experience. Retrieved from: http://www.scribd.com/doc/13414530/The-Diaries-of-ESL-Learners-A-Fresh-Look-at-Language-Learning-Experience. Malcolm, D. (2004). Investigating successful English learners in Arab medical schools. Proceedings of the Independent Learning Conference 2003, September 2004. Retrieved from http://independentlearning.org/ILA/ila03/ila03_malcolm.pdf. Parrish, M. (2010, May 22). Japanese university students’ assessments of the efficacy of various methods for out-of-class learning. Paper presented at the Japan Association of Language Teachers (JALT) PanSig Conference 2010, Osaka, Japan. Parrish, M. (2011). Extracurricular English: Diary studies of learners’ outside-of-class language practice. Annual Research Report of the Language Center, Kwansei Gakuin University, 14, 39-61. Pearson, N. (2004). The idiosyncrasies of out-of-class language learning: A study of mainland Chinese students studying English at tertiary level in New Zealand. Proceedings of the Independent Learning Conference 2003, September 2004. Retrieved from http://independentlearning.org/ILA/ila03/ila03_pearson.pdf. Enter your email address to subscribe to this website and receive notifications of updates by email.